As temperatures increase inside a vehicle cab or fire shelter, synthetic components may thermally degrade into other products by various chemical processes (mainly combustion and pyrolysis). These components include rubber, glass, different types of plastics (polyethylene, polyvinylchloride, acrylonitrile- butadiene-styrene, etc. ), and other chemical compounds found in the vehicle's seats, side panels, dashboard, carpeting, floormats, tires, electrical wiring, batteries, circuit boards, and other components hidden behind the dashboard and under the hood. This "offgassing" can release chemical products that may be toxic or dangerous at some levels. Concern has also been expressed about the chemical nature of the adhesives used in the fire shelter. Because of these concerns, the chemical quality of the air inside a vehicle cab and inside a fire shelter was studied during experiments in which prescribed fires burned over vehicles and fire shelters. For field tests scheduled in February 1996, special equipment was needed that could not only monitor the smoke and gas produced in the experiment but survive high temperatures and flame. Although many instruments are commercially available to measure chemical emissions, none is designed to measure emissions while a fire passes over them. The Fire Chemistry Research group of the Forest Service's Intermountain Fire Sciences Laboratory in Missoula, MT, has developed instrumentation that can collect samples while withstanding the hazardous environment of a fire. This instrumentation can collect particulate matter and gas samples, and monitor carbon monoxide and carbon dioxide in real time. Three of these Fire Atmosphere Sampling System (FASS) field packages were loaned to MTDC. In addition, "passive" Drager tubes were used to detect sulfur dioxide, hydrogen cyanide, and hydrochloric acid. These tubes monitored gases that were not monitored by the FASS package. Drager tubes are small, calibrated glass tubes packed with specific chemicals that change color in the presence of the chemical that the tube is designed to detect. The chemical's concentration can be calculated after comparing the amount of color change with calibration marks on the side of the tube. Passive tubes-unlike the more popular active tubes-have no mechanically drawn air flowing through them and operate on the principle of equilibrium diffusion with the surrounding air. On February 26, 1996, this equipment was deployed on a cured bunchgrass/ matted grass-thatch site at Lake City, FL, a day before the prescribed burn planned for the vehicle entrapment study. A FASS package was set up to monitor the air in each of the two vehicle cabs. The third FASS monitored the air inside a standard aluminum fire shelter. The FASS had to be modified to fit in the vehicles and the shelter. The particulate- collecting "heads" were positioned where a human would be breathing inside the cab or shelter. After particulate is collected on filters in the head, pumps that deliver a flow of 2 liters per minute draw gases through inert Teflon tubing to collection canisters and real-time sensors. The real-time data are recorded on data loggers. The tubing is protected by a loose, flexible ceramic sheathing. The tubing umbilical exposed in the cab was threaded through an aluminum pipe to support the head and umbilical and to provide protection from the high temperatures. The aluminum pipe extended from the cab interior, through the cab floor, to the ground. The 50-foot umbilical (with Teflon tubes inside) was stretched from the lee side of the shelter or vehicles to the main body of the FASS package that holds the sensors, pumps, data loggers, and canisters. The lee side refers to the side of the shelters and vehicles opposite the fire's expected approach. The umbilical and FASS were buried after they had been assembled, calibrated, and armed. The aluminum pipe inside the shelter was slanted from the FASS head to the ground, roughly simulating the position of a human body lying in a shelter. After the arm plug has been pulled, these FASS packages activate once they sense a predetermined level of carbon monoxide. Carbon monoxide is a product of incomplete combustion that will always be produced in a fire. It is one of the first gases produced and its concentration spikes sharply early in any fire episode. The passive Drager tubes were hung inside the cabs and shelter where they were protected with high-temperature foil and tape. The tubes, like the FASS heads, were positioned in the approximate area where a human would be breathing. A short-duration, low-intensity burn took place the next day. The results were disappointing. One package failed to trigger, while data from the other packages were negligible. The Drager tubes showed no color change. A second burn attempted a few days later in a Palmetto site was cool and spotty because of precipitation. Results were negligible and the Drager tubes indicated no color change. This burn yielded two major conclusions. Future burns needed to be of high intensity and long duration. In addition, we learned that we needed to develop new compact, portable instrumentation to detect and measure acidic gases that could be generated. New, simple equipment was developed to detect and measure the acid gases- hydrogen chloride, hydrogen cyanide, and sulfur dioxide (see table at right). Additional chemicals of interest were carbon monoxide, benzene, and toluene. Drager tubes would serve as the "sensors" in the instrumentation. Color changes in the tubes can be examined easily after a test. The new package used sorbent tubes in addition to the Drager tubes. These tubes generally are more accurate than the Drager tubes, but they show no color change and require laboratory analysis. Either real-time monitoring or a visual indicator like a Drager tube is needed to be sure that an experiment has produced the chemicals being studied. When both tubes are used, the Drager tubes can provide a coarse measurement while the sorbent tubes provide a fine measurement. Four types of sorbent tubes were used to measure sulfur dioxide, hydrochloric acid, hydrogen cyanide, and the b-tex compounds that include benzene, ethylbenzene, toluene, and xylene. Both the Drager and sorbent tubes in this package require a constant gas flow to be delivered through the tubes, unlike the passive Drager tubes used in the first test. A system of pumps, flow controllers, tubing, and a valved manifold system supplied the air flow. Three pumps were required for each gas sampling package (Figure 1). 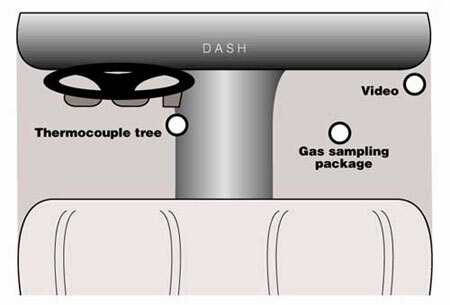 Figure 1-Schematic of the new gas sampling system used during the entrapment tests in California. A 12-volt pump pulls a steady gas stream of 2 liters per minute into the system through 14-inch ID Tygon tubing. This pump was powered by a 12-volt Power Sonic rechargeable gel battery that had a lifetime of 8 hours under continuous usage. Excess gas flow is channeled to an exhaust port. From this main gas flow, two smaller pumps pull the required air flows through 18-inch Tygon tubing to either the sorbent tube sampling train or the Drager tube sampling train. The tubes in each sampling train were arranged in parallel. Each tube has specific flow requirements that are controlled by a valved manifold. The flow across each tube is set by its associated needle valve on the manifold. The pumps pulling flow across each sampling train also can be programmed to adjust flow control. This guarantees delivery of a constant preset flow rate if the inline Teflon filter collects a great quantity of particulate or if there is a minor blockage (such as pinched tubing) in the system. Once gas has passed through the sampling trains, the gas is channeled to the exhaust ports. Outer packaging and a long-distance flow delivery system (umbilical) were needed to help the instrumentation survive the hazardous fire environment. The components of the system were mounted on an aluminum sheet that slid inside an old steel military surplus ammunition box. The system was oriented such that the box sits on its side in the field or when working with the interior components. A Swagelok bulkhead fitting provided the connection for interior and exterior tubing. The exterior PTFE Teflon tubing was 24 feet long. A soft ceramic sheath protected it from high temperatures. The sheathing must withstand temperatures as high as 1400 °C where it is exposed in the vehicle cab and shelter. The umbilical was supported by an aluminum pipe that extended from the cab, through the floor to the ground. A piece of aluminum over the end of the pipe protected the umbilical and interior tubing while allowing gases to freely enter the tubing. The next field tests were during a prescribed burn in June 1996 near Valencia, CA. Two test vehicles were used. The smaller was a Ford "Patrol" Type 5 engine. It had a four-speed manual transmission with a 1-ton chassis manufactured between 1972 and 1976. The cab interior had a large amount of vinyl and plastic. The other engine was a Crown Fire Coach, Type 1 engine manufactured in 1968. It had less plastic and synthetic material in the cab. A dividing window enclosed the front of the cab. All holes and leaks due to age were patched and plugged to simulate a new or operational vehicle that had received regular maintenance. The vehicles, shelters, and test instrumentation were deployed on June 5, 1996, for a prescribed burn scheduled that day. The vehicles and shelters were situated on the outer edge of a road near the top of a ridge. The hillside below the road had a 70% slope. The vegetation was primarily chamise and sage, fuels known for their volatile oil components. Some cut vegetation was piled in open or sparse areas near the road to provide a continuous fuel source and help create an intense, long-duration fire. 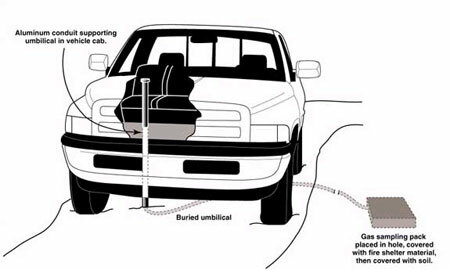 The gas detection system was deployed in a standard aluminum fire shelter and in the Ford Patrol. The umbilical was supported by aluminum pipes inside the vehicle cab (Figures 2 and 3). Figure 2-Overhead view of the instrumentation positions in the cab of the vehicle. The aluminum conduit with wiring or tubing inside was fitted through these holes and served as support and protection. Figure 3-Cutaway view of the gas sampling assembly inside the aluminum conduit in the cab of the vehicle, and underground. The remainder of the umbilical stretched across the road to the gas sampling package, which was on the cut bank side of the road. The instrumentation was on the lee side of the vehicle and shelters with respect to the direction of the fire's expected approach. Before the fire, gas flow across each tube and across the whole train was calibrated. A BIOS dry calibration, piston-type flow meter was used for the calibrations. As close to ignition time as possible, the flow controller was programmed, the pumps were started, and the umbilical and gas box were buried. These numbers are derived from calculations applied to concentrations taken from visual examination of the calibrated Drager tubes. New Drager and sorbent tubes must be used for each fire as the reagents are chemically changed, rendering further readings inaccurate or unreliable. A second prescribed burn took place the following day. The same vehicles were used. No structural damage and very little cosmetic damage (a few paint blisters) had occurred to the vehicles during the first fire. The second site had a higher fuel loading that promised an even more intense and longer fire event. The shelters and vehicles were positioned next to the edge of a road crossing the burn unit as in the first experiment. This road was on the east side of the draw. Some vegetation was cut and piled in bare and sparsely vegetated spots below the vehicles and shelters to obtain a continuous fuel source. The gas sampling instrumentation was deployed inside the Ford Patrol and standard aluminum fire shelter exactly as it had been the day before. After calibration and as close to the time of ignition as possible, new Drager and sorbent tubes were fitted into the equipment, the pumps were started, and the equipment was buried. After the fire was ignited, a wind change prevented flames from engulfing the shelters and vehicles. Thermocouple data revealed that the temperatures during the June 6 burn were somewhat higher than during the burn the day before. Those temperatures also lasted longer, an important condition for thermal degradation of materials in the vehicles and shelters. After the fire, smoke continued to rise from the interior of the patrol. When the door was opened, thick, dense, black, sooty smoke billowed out of the cab. This smoke was very black and sooty compared to the brown smoke that had collected in the cab during the first fire. The inside panel of the driver's door was smoking. The synthetic materials on the door panel on the fire side of the cab appeared to be thermally decomposing. Other synthetic materials hidden under the hood may have been in a similar condition. Because no color change was recorded in the hydrogen cyanide tubes for either field experiment, concentrations were zero or undetectable as measured by the Drager tubes. In both experiments, all chemicals other than hydrogen cyanide were detected in both the shelter and the vehicle. Concentrations were higher in the vehicle cab. The concentration of sulfur dioxide was slightly higher during the second burn. The concentrations of benzene, toluene, hydrochloric acid, and carbon monoxide all were significantly greater during the second burn, particularly inside the vehicle. 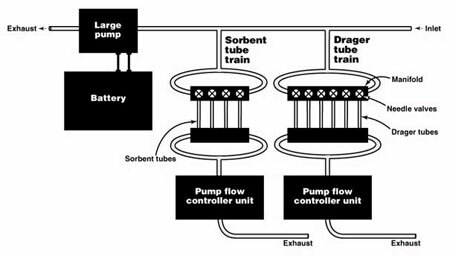 Data from the sorbent tubes for both burns were negligible and unreliable because of pump failures. The final field test was on July 24, 1996, in the Beaverhead National Forest near Dillon, MT. Two surplus vehicles, a 1955 212-ton, 6x6 Reo and a 1972 34-ton 4x4 (club cab) Dodge pickup, were positioned on an old logging road next to a windrow of lodgepole pine slash. Fire shelters were placed near the vehicles. The dry, densely piled slash and midsummer weather conditions would normally produce an intense fire with a long duration. One gas sampling system was positioned inside the newer Dodge pickup while the other was placed inside the standard aluminum fire shelter. Some modifications were made to the gas sampling system. Teflon tubing in the umbilical was replaced to ensure the system's purity. Internal plumbing was changed so that one pump flow controller unit was pulling across both the Drager tube and sorbent tube trains. A temperature label was slipped inside the Tygon tubing to monitor gas temperature at the entrance of the gas sampling package. Check valves were added at strategic points to prevent backflows that could contaminate the system or sample tubes. New Drager and sorbent tubes were placed in the collection unit after a calibration test. The windrow of fuel was ignited. The wind changed direction and flames did not engulf the sides of the vehicles and shelters as expected. Sooty, dark smoke did collect in the vehicle cabs. After the fire, the boxes were retrieved, the tubes were removed and capped, the postfire flow calibrations were performed, and the Drager tubes were examined. The sorbent tubes were sent to the Clayton Environmental Laboratory for analysis. Each yielded the results shown in the two tables below. Prefire and postfire calibration data indicated that the sorbent tubes still had flow problems. With such a problem, concentrations could be off by a factor of 10. Although concentrations may have been off, all test chemicals were detected by the sorbent tubes. The concentrations of benzene and toluene were the highest among the gases studied, whether they were measured by sorbent or Drager tubes. Gas concentrations were higher in the vehicle than in the shelter except for hydrogen chloride, where the difference was minimal and the concentrations were low. This test had mixed results. Benzene and toluene appear in concentrations that are nearly as high if not greatly higher than concentrations produced in the California burns. Concentrations of sulfur dioxide, hydrochloric acid, and carbon monoxide were lower than those detected in the California field tests. Temperature data obtained from the thermocouples show that this fire had the longest duration. The temperatures peaked slightly below those of the second California burn but were sustained at higher temperatures for a longer time. The concentrations derived from the field tests may underestimate the true chemical concentrations. Correction factors were made for the excess amounts of flow before ignition. It is impossible to visually judge when gases are no longer being produced at the end of the experiment. Air volume is measured to the time the system is stopped, whether that air contains gases or not. That may flush and dilute gases in the sample tube. From 1960 to 1975, the average amount of plastics in vehicles increased from 25.9 to 129.5 pounds. This trend has continued. Today the average vehicle contains over 200 pounds of plastic. Barbara Levin has compiled a literature review (Levin 1987), The Chemical Nature and Toxicity of the Pyrolysis and Combustion Products of Seven Plastics. Seven plastics were documented to produce over 400 chemicals. All seven plastics (Table 1) could generate carbon monoxide, and six of the seven could generate benzene and toluene. The table shows some of the data from her literature review. Many plastics, including those commonly found inside motor vehicles, can produce the chemicals detected in these field tests. The flash ignition and decomposition temperatures (Table 2) for some of these plastics are in the range of temperatures reached inside or near the cabs of the vehicles (Table 3) during the tests. Long polymer chains decompose in the presence of heat or flame, producing chemicals of lower molecular weights such as hydrogen chloride, hydrogen cyanide, and similar chemicals. Smoke, ranging in color from dark brown to dense sooty black, accumulated in the cabs of all the test vehicles during each of the field tests. Even after the June 6 burn was over, the Patrol continued to generate this smoke. This provides some evidence that the smoke was generated from some of the vehicle's synthetic components. In the early stages of decomposition, styrene polymers and acrylonitrile-butadienestyrene (ABS) characteristically generate black, sooty smoke rich in aromatic polymers. Table 1-Gases produced by seven plastics. Table 2-Flash ignition and decomposition temperatures for six plastics. Table 3-Temperatures reached in the outside air, inside a vehicle cab, and inside and outside a fire shelter during three tests. Carbon monoxide can be produced as a byproduct of the thermal decomposition of many plastics. It is also a product of incomplete combustion and is produced in any wildfire. A portion of the carbon monoxide detected may have come from smoke produced by natural fuels. Sulfur dioxide may be produced by thermal degradation of tires. Some tires were undamaged during the first California burn but caught fire during the second. During the Montana burn, tires burned on the side facing the fire and smoked on the other side. Concentrations of sulfur dioxide were highest during both the California burns, even though the tires generally did not burn or smoke. Industrial processes in the state may have contributed to the concentration of sulfur dioxide. Baseline data before the experiment could have helped determine the ambient concentration of sulfur dioxide on the day of the burn. The fire shelter contains no plastics to serve as a source for these chemicals. However, all chemicals except hydrogen cyanide were detected in the fire shelter. Hydrogen cyanide is a component of the adhesives used in the shelter. This chemical was not detected by the Drager tubes and was only detected in small quantities in just one experiment by the sorbent tubes. The proximity of the shelters to the engine may have contributed to concentrations of these compounds. The swirling winds may have transported the chemicals to the air near the shelter and mixed the gases there. Pinholes and pores in the shelter material may have allowed the gases to enter. Smoke may have gone under the fire shelters. This is unlikely because heavy chain weighing down the inside perimeter of the shelter appeared undisturbed after each experiment. The lowest concentration of all chemicals except toluene was recorded during the Montana burn, when the wind was moving the fire's smoke away from the vehicles. The questions raised by these results might be answered if an additional gas sampling unit were deployed inside the burn unit to measure ambient gases near the shelter and vehicle. A special thanks to the Intermountain Fire Sciences Laboratory Fire Chemistry Research group, Clayton Environmental Laboratory, and the MTDC purchasing and shop personnel. -Lynn Weger has worked on fire projects at MTDC since 1996. She graduated from the University of Montana with a B.S. degree in chemistry in 1987 and began working at the Forest Service's Intermountain Fire Sciences Laboratory the following year. The following is the list of components used to assemble the gas sampling system. Diaphragm pump, 5 x 4 x 2-1/2 inches, 12 volt dc, 1.5 amps KNF Neuberger, Inc.
Drager tubes National Draeger, Inc.
Sorbent tubes National Draeger, Inc.
Dean, K. C.; Sterner, J. W.; Shirts, M. B.; Froisland, L. J. 1985. Bureau of Mines research on recycling scrapped automobiles, Bulletin 684. U.S. Department of the Interior. 46 p.
Drager organization. 1994. Drager-tube handbook. Gad, Shayne C.; Anderson, Rosalind C. 1990. In: Combustion toxicology. CRC Press: 147-192. Gerstle, R. W.; Kemnitz, D. A. 1967. Atmospheric emissions from open burning. Journal of the Air Pollution Control Association. 17(5): 324-327. Guastavino, Thomas M.; Speitel, Louise C.; Filipczak, Robert A. 1982. The pyrolysis toxic gas analysis of aircraft interior materials. Final report to the Department of Transportation. 33 p.
Huggett, Clayton; Levin, Barbara C. 1987. Toxicity of the pyrolysis and combustion products of poly(vinyl chlorides): a literature assessment. In: Fire and Materials. Vol. 2: 131-142. Landrock, Arthur H. 1983. Handbook of plastics flammability and combustion toxicology. Noyes Publications. Levin, Barbara C. 1987. A summary of the NBS literature reviews on the chemical nature and toxicity of the pyrolysis and combustion products from seven plastics: acrylonitrile-butadiene- styrene (ABS), nylons, polyesters, polyethylenes, polystyrenes, poly (vinylchlorides) and rigid polyurethane foams. In: Fire and Materials: Vol. 2: 143-157. Madorsky, Samuel L. 1964. Thermal degradation of organic polymers. Interscience Publishers. Miller, James A.; Fisk, George A. 1987. Combustion chemistry. Chemical and Engineering News: 22-44. Nelson, Gordon L. 1990. Fire and polymers; hazards identification and prevention. Washington, DC: American Chemical Society: 542-565. Paabo, Maya; Levin, Barbara C. 1987. A literature review of the chemical nature and toxicity of the decomposition products of polyethylenes. In: Fire and Materials. Vol 2: 55-70. Paabo, Maya; Levin, Barbara C. 1987. A review of the literature on the gaseous products and toxicity generated from the pyrolysis and combustion of rigid polyurethane foams. In: Fire and Materials: Vol. 2: 1-29. Ryan, Jeffrey V.; Lutes, Christopher C. 1993. Characterization of emissions from the simulated open-burning of non-metallic automobile shredder residue. Final report to the Environmental Protection Agency. 73 p.
Sarkos, Constantine P.; Hill, Richard G. 1988. Characteristics of transport aircraft fires measured by full-scale tests. Paper No. 467-11 from the Aircraft Fire Safety Conference Proceedings: 11-1 to 11-18. Sarkos, Constantine P.; Hill, Richard G.; Howell, Wayne D. 1988. The development and application of a full-scale wide body test article to study the behavior of interior materials during a postcrash fuel fire. Paper No. 123 from the Aircraft Fire Safety Lecture Series: 6-1 to 6-11. Terrill, James B.; Montgomery, Ruth R.; Reinhardt, Charles F. 1978. Toxic gases from fires. Science: 200 (4348): 1343-1347.